I've been included on the Official Team of AccuQuilt Bloggers!! I'm VERY excited about this as I will have lots to share and firsthand information for you about Sales and Special Offers! 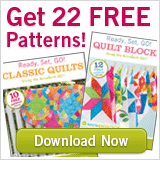 First of all, click on the image below to get 22 FREE DOWNLOADABLE PATTERNS from AccuQuilt! Next, visit these links for information about ongoing sales! Some of them end soon so GO NOW!